Posted by V the K at 1:34 pm - November 26, 2016. 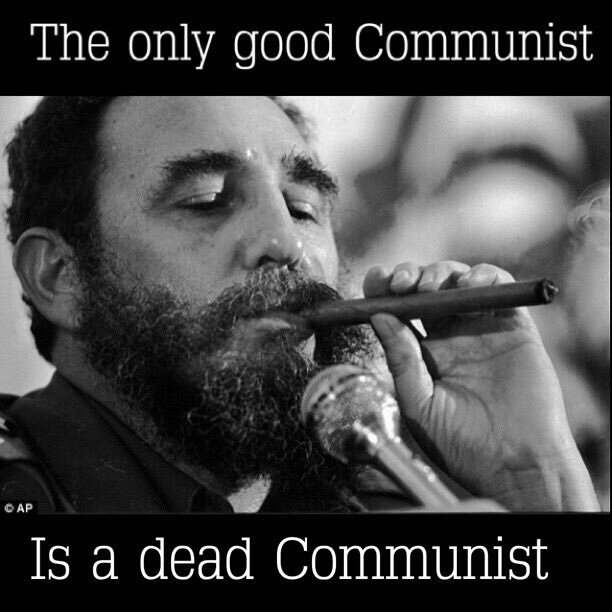 The Democrat Left is mourning the loss of their Communist Icon Fidel Castro. Here is what Canada’s Leftist Hipster Prime Minister Justin Trudeau had to say. Jimmy Carter, same song, second verse. Posted by V the K at 9:24 am - November 26, 2016. If there is a hell — one of humanity’s greatest monsters is burning in it today. Fidel Castro is dead at ninety. Far too long, if you ask me. Castro was a brutal, Socialist, dictator who consigned millions of his people to life in an oppressive, impoverished gulag where they enjoyed no civil liberties and no human rights. He sent troops around the world to commit atrocities against civilians; imprisoned, tortured, and murdered political opponents (or any critics of his regime), sponsored terrorism, and… oh yeah.. sent gay Cubans to concentration camps. No doubt, millions of Democrats will be mourning the death of this brutal, absolutist dictator whom they have long envied for being able to fundamentally transform his society against the will of his people… just as they would wish to do here. BTW: Castro died with a Net Worth of close to a billion dollars. So I guess Obama’s dilemma is whether to mourn the loss of a fellow traveler, or once again take credit for something he had nothing to do with.